You could hear the sound of a drum resounding through the South Central region of Africa. People came from the North, South, East and West, for one purpose; to be reunited as a family. On the 9th of August, YWAM South Central Africa gathered for their annual two years regional staff conference in Livingstone, Zambia. Altogether they formed a family rich in diversity and flavour, living throughout Angola, Zambia, Mozambique, Zimbabwe and Malawi. 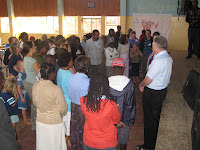 YWAM South Central Africa is rich in its assortment of ministries, but this was not the centre of the conference. The message of the conference was simple, ‘together for the harvest’, and the focus was to rest and to be set free from bondages and fears that withhold us from walking in our full potential serving God. To be unified as a region and together reach these nations for God. Words of encouragement were spoken. 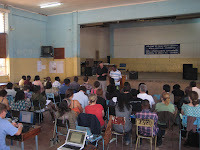 “We are people of labour, people of turmoil, but the number one in spiritual warfare is to rest, rest for strength.” Jonathan Mumbi, director of YWAM Zambia said on the first day. This set the tone for the conference. Guest speaker of the week was Don Gillman, base director of YWAM Taiwan. He inspired us with his message and challenged us with his life stories and questions. A few of his questions were, how far are we willing to go for the gospel, what fears are keeping us from the will of God, what is true obedience and what are our value systems? Through the daily preaching there was a calling to come back to the heart of God to find rest, to be strengthened, and to receive Gods grace in the middle of struggle or victory. To come back to a place where we “Obey the Father and not the need of men.” (Oswald Chambers). With teachings in mind, fellowship in the heart and a cup of tea in hand, YWAM South Central Africa together tackled their fears and discussed their value systems. At the end of the conference people were returning to their homes, encouraged and prepared for the task before them.